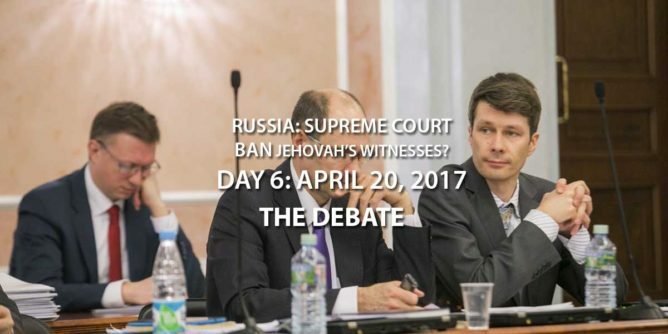 April 20, 2017 – Sixth day of the Russia Supreme Court case brought by the Justice Ministry to ban Jehovah’s Witnesses in the Russian Federation. Today’s proceedings is in the format of a debate. The Ministry of Justice presents their reasons for banning Jehovah’s Witnesses and liquidating all of their assets, namely the Administrative Center of Jehovah’s Witnesses in St. Petersburg and the 395 LROs scattered throughout the country. 13:15 The courtroom of the Supreme Court gradually filled with spectators. There was a feelings of nervousness and restrained excitement. The parties were preparing their speeches to deliberate in the debate. 13:50 Most of the seats were filled by this time. 14:09 The hearings begin. Omelchenko made a quick petition to attach a statement from the European Union on the persecution of Jehovah’s Witnesses in Russia to the case materials. In it, the European Union said that “the statement of March 15, filed by the Ministry of Justice of the Russian Federation in the Supreme Court, is the last severe measure taken in its fight against Jehovah’s Witnesses and these prosecutions they are subjected to in Russia is a further increase in violations of their rights which contradicts international standards in the field of freedom of religion or belief.” The court asked how this statement could affect the outcome of the day’s proceedings. Omelchenko said that this is evidence of a violation of Article 18 of the European Convention. Although the European Union is not a body of the Council of Europe, it was made at a meeting of the Council of Europe. 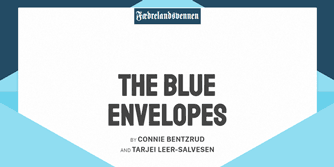 The court refuses to attach the document. 14:15 The court started the debate. The Ministry of Justice representative made her case. 14:16 The Ministry of Justice drew attention to the fact that Russia adheres to the principle of the rule of law. The law on freedom of conscience provides a framework. 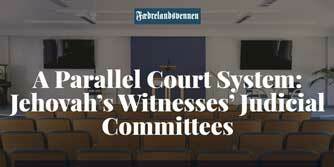 The Ministry of Justice drew attention to the fact that the very name of the Center, the “Administrative Center of Jehovah’s Witnesses in Russia,” indicates that the centralized organization exercises control over the LROs. The Ministry of Justice drew attention to the leading role of the Administrative Center in its interactions with the LROs. The Administrative Center agrees on the issues related to the appointment of the chairmen of the LROs, etc. 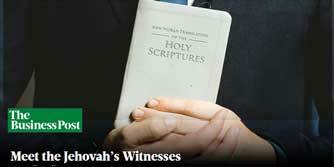 Organizations of Jehovah’s Witnesses are a holistic organism. They are characterized by organizational unity. References to the canonical connection by the Ministry of Justice are inconclusive. 14:25 According to the Ministry of Justice representative, the face that the defendant continues to claim that there was planting of extremist materials indicates that the Administrative Center does not repent of its extremist activities. 14:28 The Ministry of Justice representative continued: Although many religions express some sort of relationship with secular authorities, the texts of Jehovah’s Witnesses contain prohibitively insulting ways of expressing the truth of their beliefs. Extremists do not recognize quotes from the bible, but rather their interpretation of what is written in the bible. 14:35 The Ministry of Justice believed that the numerous court decisions made in connection with what materials they recognized as extremist should have given the Administrative Center enough of an opportunity to determine what literature not to import into the country. 14:35 The fact is, according to the Ministry of Justice, over the last 25 years, the Administrative Center had imported materials that were later recognized as extremist. 14:38 The Ministry of Justice believes that because “extremist” (as applied to Jehovah’s Witnesses’ literature) is placed within quotation marks in the literature of Jehovah’s Witnesses, they are being cynical of the matter – despite the fact that the courts’ decisions to recognize extremist literature had entered into legal force. 14:40 Summing up, the Ministry of Justice representative, as before, asks to liquidate the Administrative Center, all the LROs and confiscate all of their property – without waiting for the court’s decision to put it into legal force. 14:42 Omelchenko, on behalf of the defendant, the Administrative Center, began his speech in the debate. 14:45 Omelchenko analyzed the non-legal nature of the Ministry of Justice’s generalization that the various organizations of Jehovah’s Witnesses are supposed to be a single organization “with structural units”. 14:50 Omelchenko cited the norms of legislation on countering extremism. The law does not provide for such extremist actions as “an act in the form of inaction”, “an act committed inadvertently, by imprudence”. The Supreme Court of Russia has repeatedly pointed out that extremism can only be active actions aimed at violent change of the foundations of the constitutional system. 15:16 Lawyer Chenkov spoke in the debate. He began with his personal impression of the last few days. He found himself in one of Moscow’s parks and saw that dozens of Jehovah’s Witnesses came to this park. They did not have any posters and they did not come out to protest the lawsuit that began in the Supreme Court on April 5, 2017. They went out to clean up the garbage that had accumulated over the winter. So who are these people? Extremists or good Christians? 15:20 The Ministry of Justice has demanded to take all the buildings of worship of Jehovah’s Witnesses in Russia, built by believers at their own expense. This happened only once in Russia, namely, a hundred years ago, in 1918. At that time, the Council of the People’s Commissars decreed that all property be taken away, including the religious buildings of the Russian Orthodox Church. 15:27 Zhenkov: The Ministry of Justice suggested that Jehovah’s Witnesses, through despair, said that the cases against them were falsified. However, believers do not despair, notes Chenkov. They believe the words of the Bible that there is nothing secret that would not become obvious. And everyone will bear responsibility before God for their deeds. Just the other day, on April 17, 2017, the President of the Russian Federation approved an amendment to Article 303 of the Criminal Code of the Russian Federation, now provides for criminal liability for falsifying evidence in administrative cases However, the problem of falsifications should concern not only the President, but all of the executive bodies, such as the Ministry of Justice (Justice in Latin means justice). 15:35 In this case there are dozens of certificates: gratitude, not only for the improvement of the country, but for an active life position, for helping those affected by natural disasters, for helping Internally Displaced Persons (IDP) from the territory of Ukraine, for helping orphanages, for improving the leisure center for children with disabilities, for participation in the marathon “Help the child”, etc. “Is it so that the organization is both useful and dangerous?” Chenkov is perplexed. 15:40 Chenkov analyzed the testimony of witnesses, both from the plaintiff’s side and from the defendant’s side. 15:46 Chenkov: “In this room, there was a man who was born in prison. Because his mother was sentenced to 8 years imprisonment when she was 5 months pregnant as an enemy of the state just because she was a Jehovah’s Witness. She gave birth in prison, and he spent two years in a prison orphanage. His father could not take him, because he was exiled to Siberia. In 1991, the state recognized the mother as a victim of political repression, apologized to her, and provided her with a pension. And here in court this person, who was born in prison, approached me and asked: “Does the Ministry of Justice wish to repeat this terrible story?”. And I did not know what to say. I still do not know what moves the representatives of the Ministry of Justice and those who direct this process. 16:02 Speaking about the independence of the LRO, Toporov refers to the Charter of the Administrative Center. LROs are endowed with the absolute right, without taking into account the will of the Administrative Center, to determine the term of their presence in the said structure, to resolve issues of liquidation, transfer to other centralized religious organizations, etc. “The Administrative Center does not have the right to liquidate the LRO, as it is not their founder … What is this structural unit?” – asks Toporov. 16:13 Novakov was next to speak in the debate. He drew attention to the fact that due to the suspension of activities, believers throughout the country were subjected to massive violations of rights: law enforcement officers invaded the services and copied personal data of citizens who had not committed any offense. The police officers carried out illegal detentions by bringing them into custody, personal searches, videotaping of persons. Administrative cases are raised, warnings are made about the possibility of criminal prosecution under Article 282 of the Criminal Code. 16:32 Novakov recalled that the Ministry of Justice representative accused Jehovah’s Witnesses of cynicism in her debate. “I’ll tell you what cynicism is,” Novakov said. “When the Ministry of Justice in the first trial of the LRO says that the rights af the Administrative Center are not affected, but then makes those court decisions as the basis for the elimination of the Administrative Center. Or when the Ministry of Justice perceives much more harsh statements against Jehovah’s Witnesses as “ordinary criticism”, while calling “extremism” those statements that are far from extremism. When, contrary to the available data, the Ministry of Justice dismisses reports of falsification, it does not dare to cite cases when falsification is clearly fixed on the video. “That’s what cynicism is!” Novakov concluded. 16:40 Cherepanove next spoke in the debate. 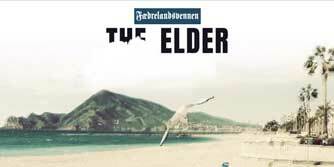 He believed that if the court left Jehovah’s Witnesses to exist legally, Russia will not only not suffer damage, but on the contrary will improve its reputation both inside the country and in the international arena. Decisions against Jehovah’s Witnesses have been appealed to the ECHR and the UN Human Rights Committee. 16:47 Cherepanov spoke about the problem of denigrating the good name of Jehovah’s Witnesses in the media. Various crimes had been attributed towards them, for example, “weaning apartments.” Proving the falsity of this myth, Cherepanov recallsedthe biblical commandment “Do not covet someone else’s wife”. 17:00 Both sides exchanged remarks. 17:01 The Ministry of Justice representative recalled that the essence of the complaint is to liquidate a legal entity; the Justice Ministry does not make complaints against individuals. The Justice Ministry reminded the court of the testimony of one of the witnesses of the plaintiff who was expelled from the religious community. The Ministry of Justice considered this a violation of the rights of citizens. In response, Chenkov recalled that at one time the Russian Orthodox Church excommunicated the writer L. Tolstoy. In our time, the ROC refused to cancel the decision on excommunication, despite the petitions for this. This is an internal matter of the church. Chenkov asked whether the Ministry of Justice intended to present any demands to the ROC. 17:09 The court retires to the advisory room. 17:18 The courtroom is filled with television journalists. 18:25 The court is still in the advisory room. The courtroom awaits the announcement of the judgment. 18:50 The Supreme Court decided to liquidate the centralized religious organization of Jehovah’s Witnesses in Russia, as well as all 395 local religious organizations of this religion. Believers have already begun to prepare a complaint to the appellate court (a panel consisting of three judges of the Supreme Court), which should be considered within a month.